This short article about an unusual Munich Child stein appeared in two parts in Prosit of December 1999 and March 2000. 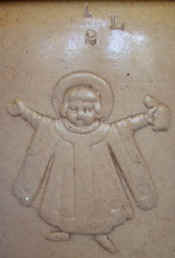 [December 1999] Most ceramics collectors know of the saltglazed works of the Doulton Pottery in Lambeth, the seventh borough of the city of London. During the second half of the 19th century they made many mugs and bottles with a honey-brown, somewhat speckled glaze, which is easily recognized. 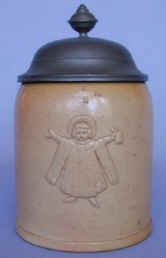 As stein collectors, we are also quite familiar with the figure of the Münchner Kindl, or Munich Child. But we don't expect to find this symbol of Munich on a lidded beer stein manufactured by Doulton in England! 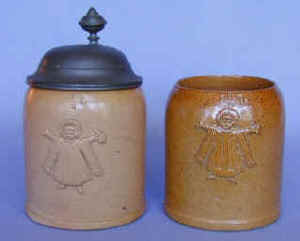 To the left we see a half-liter stein bearing the image of the Munich Child in relief (close-up shown to the right). It's attractive because of its nice glaze and simple execution, but so far unremarkable. 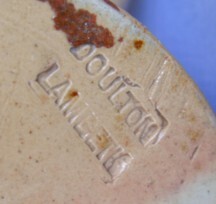 Turning it over, however, we find the incised trademark of DOULTON LAMBETH (below, center). How did the Munich Child wind up in London? 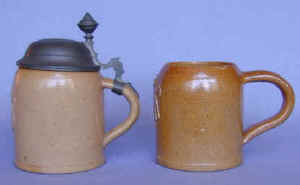 How did an English firm come to produce a stein complete with a hinged pewter lid and thumblift (unmarked) which are thoroughly German in character? Why is the capacity marked below the front rim in liters instead of English measures? One can well imagine the puzzled reaction of the English worker handling this piece who looked at the the foreign relief figure and said, "Reminds me of a ginger biscuit; think I'll fix some tea." 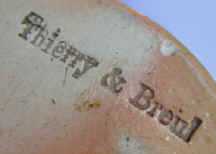 There is one further clue to this mystery on the base of the stein, the incised trademark of "Thiery & Breul" (below, right). But so far, this is a mystery mark, and the questions remain. Do any of you have the answers? [March 2000] The unusual Doulton stein depicting a Münchner Kindl prompted Bernard "Bunny" Harrison of Slaugham, West Sussex, England, to contact the Doulton Museum for information. Ms. Julie McKeown, Curator of the Sir Henry Doulton Gallery replies: "I was interested to see the photographs of the half-litre stein bearing the Munich Child motif on a stein made by Doulton & Co. at Lambeth for Thiery & Breul. I have certainly never come across this piece before and neither is its manufacture recorded in what few archival documents we have relating to the Lambeth factory. The backstamp was one used between c1858 and 1891, and the style of the stein certainly looks earlier rather than later. "The design of early Doulton Lambeth saltglazed stoneware Art Wares was influenced by Rhenish stoneware and the pottery industry of Siegburg, Raeren, Höhr, Grenzhausen and other parts of the Rhineland. I have been unable to find any further connection between Germany and Doulton & Co. other than their participation in exhibitions in Hamburg in 1863. It could be that it was on this occasion that an order was placed by Thiery & Breul (whoever they might be!) for a reproduction stein. Certainly it is not a standard Doulton shape." [Later correspondence] After reading the above article, Bob Alutin sent me an unlidded version of this same piece (shown below alongside the stein discussed above). He had acquired this damaged stein some time ago in order to salvage the lid. There are a few noticeable differences between this unlidded stein and the one which prompted this line of inquiry; there is quite a difference in the color of the glaze, the handle shapes are different, and most notably, the base is entirely unmarked. Unfortunately, there is still no clarification of the origins of this stein. This firm was apparently engaged as an importer and middleman in the retail industry. They presumably ordered the production of this stein by Doulton, who impressed the firm's name into the base.